Hairy leaves and stems that look like they’re covered with spider webs. Yellow flowers with red spikes around it. Has sharp pointy spines. Used for women who have painful periods, menstrual headaches, menopause, heavy bleeding, help produce mothers milk, menstrual flow stimulant, cervical dysplasia, yeast infections. Do not take during pregnancy. Used for overcoming anorexia, headaches, clogged liver, indigestion, enhancing immune system, cancer, bleeding. Supports the liver in releasing toxins. 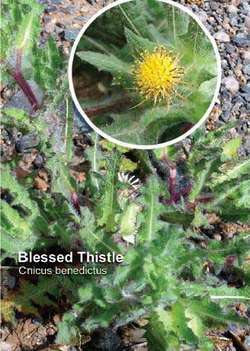 Holy thistle has been used medicinally for over 2000 years for such things as liver disorders such as jaundice, hepatitis, gallbladder problems; also for promoting lactation, spleen, psoriasis, mushroom poisoning, HIV, AIDS. Contains silymarin which protects, stimulates and regenerates liver cells. Bile flow stimulant (gallbladder). Mild laxative. Used to counteract the harmful actions of alcohol on the liver (cirrhosis), and helps liver heal. Used to purify and circulate blood. Also used for stomach and digestive problems, digestion enhancement, intestinal gas, indigestion, heartburn, constipation, strengthens heart, liver, lungs, and kidneys. Used historically for smallpox, malaria, cancer, fever, dyspepsia, skin ulcers. Increases appetite in people with anorexia, but not normal people. Leaves and stems can be eaten as a salad green, juiced or blended. A common plant that grows along roadsides and is ironically considered a pesky weed. Do not take in large doses, may cause vomiting.